Clarets boss Sean Dyche believes his players are running that extra mile in their quest for Premier League survival. Data collated by EA SPORTS Player Performance Index, the official player ranking index of the Premier League, illustrated that summer signing George Boyd had covered more ground in a single game than any other player in England’s top tier this season. In Burnley’s 2-1 win against Stoke City at the Britannia Stadium at the weekend the 29-year-old topped the charts when registering 8.29 miles throughout the 90 minutes. The former Tiger, signed by Dyche on deadline day, is also ranked fourth and ninth among the Premier League’s top 10 - covering 8.07 miles and 7.95 miles in respective fixtures against Hull City and West Ham United. Dyche underlined the importance of work-rate, energy and integrity within his side’s performances, stating that those attributes are a vital marker in pushing to compete at this level. 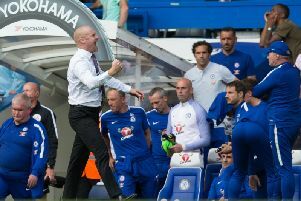 “There’s a great belief in the physicality of the game,” said Dyche, whose side have out-run their opposition in 11 of their 12 outings. “I look in the Premier League, the Championship and the Champions League and some of the coverage - the high intensity, high speed runs - are all markers because the game is telling you that you have to do that. “We make sure the players are fit - it was well spoken about last season - but we also ensure that they’re mentally fit. We believe this group will go harder for longer than other teams no matter what division we’re in because the mentality and the physical stimulus is right. Dyche added: “The players have shown this season that they’re willing to deliver physically - add in the framework of the team and they’ve got their own individual freedom to deliver quality. We feel they can deliver on a physical level, it’s only a marker, but it’s an important marker. “We want to compete - it doesn’t guarantee you anything but we want to be a team that’s competitive on a weekly basis.